UNITED NATIONS ACADEMIC IMPACT AND MCN PROUDLY PRESENT ELIJAH DEAN SMITH, A MILLENNIUM FELLOW FOR THE CLASS OF 2018. "I am motivated to do my part in ending hunger, because I've been on both sides of the coin, and also see ways that I can inspire people in my community to make a difference by using what we already have more effectively rather than wasting it. As a small child growing up in Los Angeles, food was harder to come by, as my father (a teacher) was the sole breadwinner for our family. Even in the best of times, sometimes I’d have a tortilla with cheese as a meal, as there wasn’t enough for anything else. There was a ‘Homework Club’, however, which was run out of the elementary school library by some teachers that would volunteer an hour and a half after school to help the students. The employees of the school cafeteria would come to donate peanut butter & jelly sandwiches, milk pouches that needed to leave the school soon due to best by dates. This supplied me and my sister with a constant meal during the day, taking stress off of my mother. The kindness and resourcefulness of these workers to provide children, like me, with the food necessary to grow, learn and develop, was astounding and has really stuck with me to this day. As I arrived in college and was able to analyze hunger and food insecurity further, what I found really astounded me. In Arizona, 1 in 4 children will face hunger and food insecurity in their lives, and this will set them up for increased rates of chronic illness, anxiety, and depression. This means that, beyond having children and adults never being given the chance to realize anywhere close to their human potential, we will also continue to see increases in deaths in our society, and all of this can be prevented. I was also astounded by how wasteful we were with our meal plans at colleges. At ASU, we have to pay $965-$2400 per semester for meal plans that come with anywhere from $100 M&G to $1000 M&G semesterly, M&G being the currency that we use at restaurants and shops on campus. I saw that many of us struggled to spend all of our money, which would be forfeited at the end of the year. This would result in us spending it as fast as we could to avoid wasting it, but this is waste in itself, since this excess that could benefit someone else is being used selfishly on ourselves. If each first-time freshman were to forfeit $20 of M&G, this adds up to $207,820 that could be used productively. Knowing that there are people in our communities that could use this money to feed themselves, and instead it is being wasted, has made me more determined to do my part and bring attention to this issue on my campus, inspire my classmates to use funds productively, and eventually spread this model to other schools with similar meal plan models." Elijah Smith is a senior at Arizona State University studying Computer Information Systems. 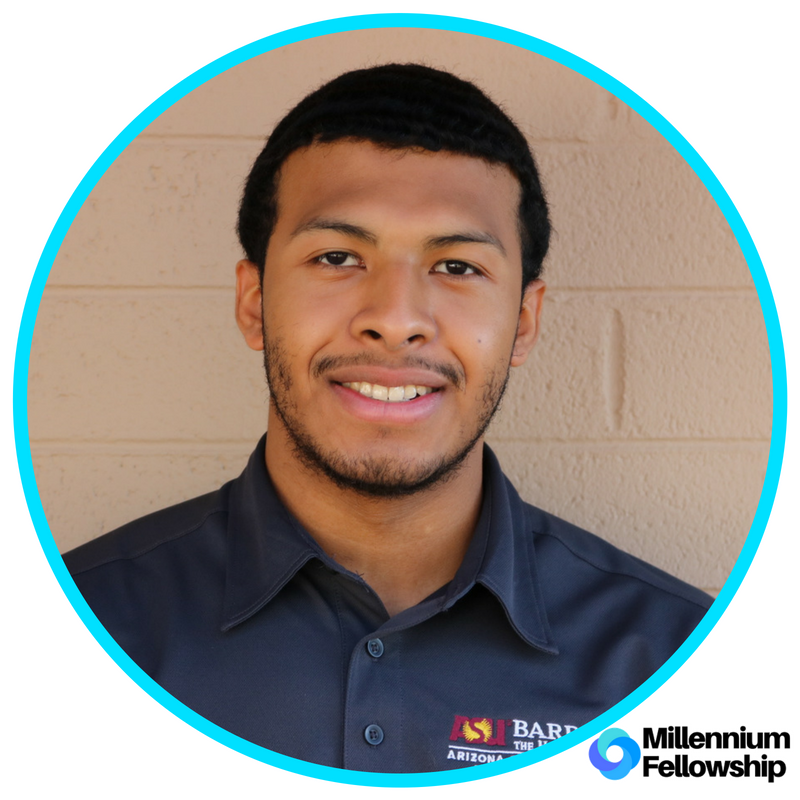 He has worked as a Student Recruiting Assistant for the ASU Football program and is currently a Community Assistant for Barrett, the Honors College and a Sports Program official for ASU Intramurals. He also serves as an executive board member of the 942 Crew Student Section and was also a member of the 2017-2018 Tillman Scholars Cohort, where he was able to further explore his desire to aid in the effort to eliminate food insecurity and hunger. He enjoys introspective strolls in the moonlight outside of academics.